For those within driving distance of central New Jersey, documentary, “How They Got Over: Gospel Quartets and the Road to Rock ‘n’ Roll,” will be screened this Sunday, January 27th, on the Rutgers New Brunswick Campus as part of the New Jersey Film Festival. 7:00 PM. Director Robert Clem and producer Jerry Zolten will be there to naswe questions in a Q&A after the film. 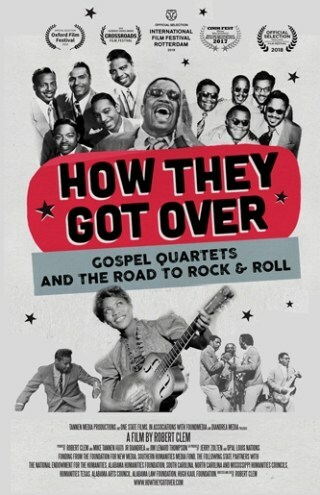 “How They Got Over” is a stirring documentary about African-American gospel quartets like the Soul Stirrers, the Dixie Hummingbirds, and the Blind Boys who developed a hugely influential musical spirit and style. Gospel quartets synthesized an energy and beat that evolved into doo-wop, rhythm and blues, soul music, and rock and roll. Quartet music also became a lifeline for African Americans who took to the road as radio and records became popular, popularizing an energetic musical form that was both infectious and moving. Featuring interviews with legendary singers, the film documents how quartets choreographed their gestures — shouting, bending over backwards, dancing, jumping off the stage – to move their audiences. Pioneers of rock and roll, they created the unforgettable music that animates this film. 2018; 87 min. Q+A Session with Director Robert Clem and Producer Jerry Zolten! Co-sponsored by the Rutgers University American Studies Department! Map and Directions are also here.